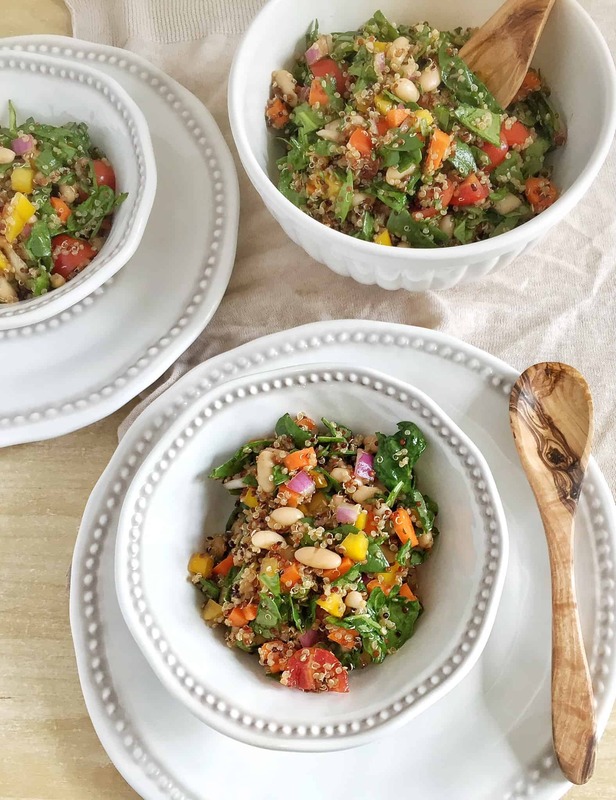 Colorful and refreshing, this light quinoa salad is packed with nutritious phytonutrients. Fresh basil and chopped veggies are combined with quinoa and white cannellini beans and then tossed in a simple balsamic vinaigrette. Credit for all of the lovely colors in our fruits and vegetables is due to a group of chemicals called phytonutrients, naturally occurring compounds found only in plants that give off pigments and have some pretty impressive health benefits. Phytonutrients (aka phytochemicals) act as antioxidants, lower inflammation markers, and support a strong immune system. Where can you find phytonutrients? 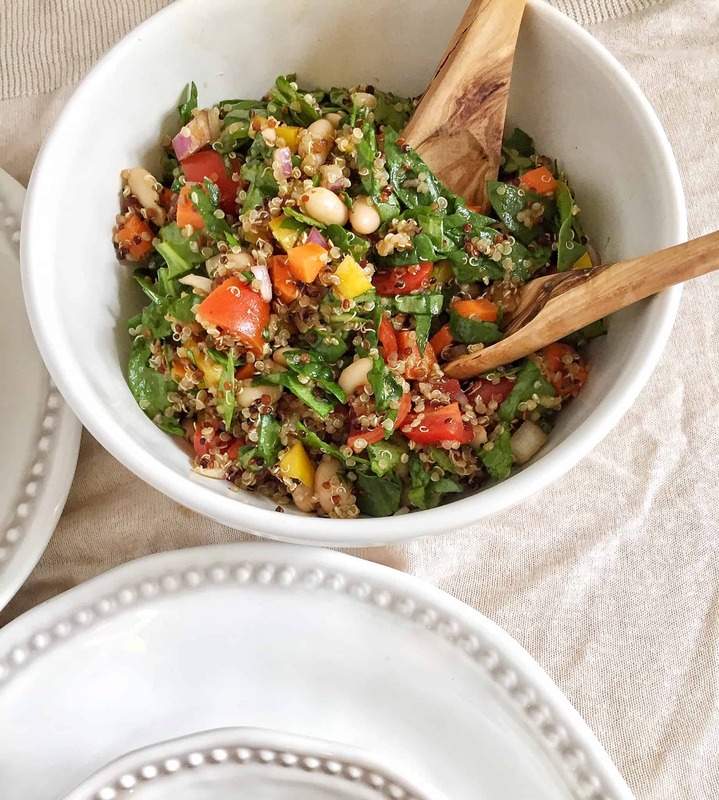 With bright colors and plenty of phytonutrients, I was drawn to a combination of fresh tomatoes, onion, carrots, spinach, pepper, and basil in this Rainbow Quinoa salad. It’s delicious warm or cold and a great one for packed lunches or picnics. Organosulfurs, found in garlic and onions, may improve circulation and protect against oxidative damage. A preliminary study also indicates that organosulfurs have potential anticancer activity. Bell peppers, carrots, tomatoes, and spinach can all thank the carotenoids for their bright hues. Phytonutrients like beta-carotene, lycopene, and zeaxanthin all belong to this group. Beta-carotene gives off a yellow or orange color and can be converted into vitamin A, an essential micronutrient that supports eye health and a strong immune system. Whole grains are a good source of a group of phytonutrients known as phytosterols. Studies suggest that these phytonutrients decrease cholesterol absorption and help to lower LDL cholesterol levels in the blood. I’ve found that the combination of whole grains and fresh vegetables tossed in a homemade vinaigrette is just about the tastiest way to enjoy all of the advantages that these phytonutrients have to offer. 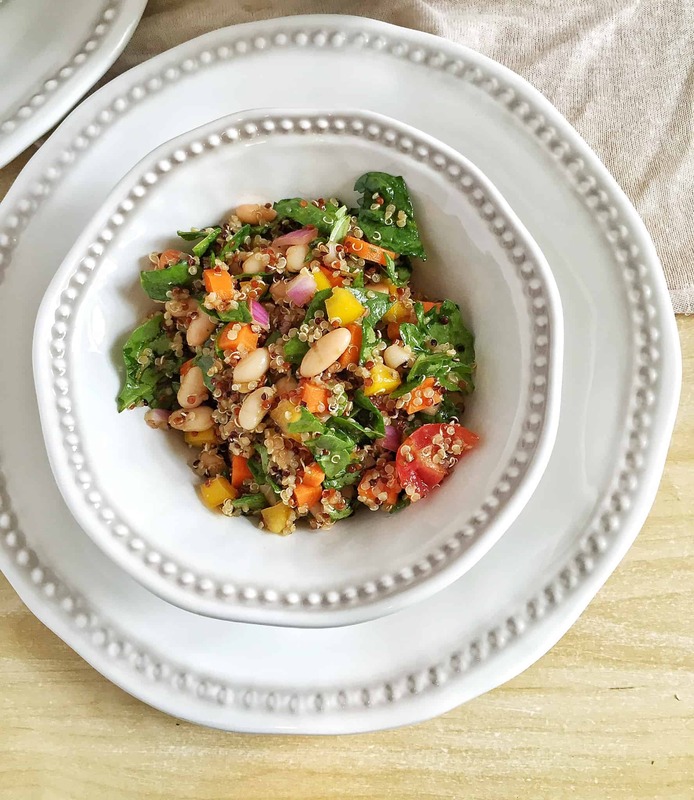 To prepare, simply combine chopped veggies, beans, and cooked quinoa in a large mixing bowl. Whisk together dressing ingredients in a separate bowl first, and then toss with the salad. Feel free to play around with the types of vegetables or whole grain you use in this recipe. Check out my seasonal produce guides for some ideas and inspiration. What’s your favorite colorful vegetable combination? I love quinoa salads mixed with veggies and a nice vinaigrette! Great listing of phytonutrients and where they’re found! Only wish it was pinnable!! rachel @ athletic avocado recently posted…Gardein Review+ Vegan Mango Lime Meatballs!